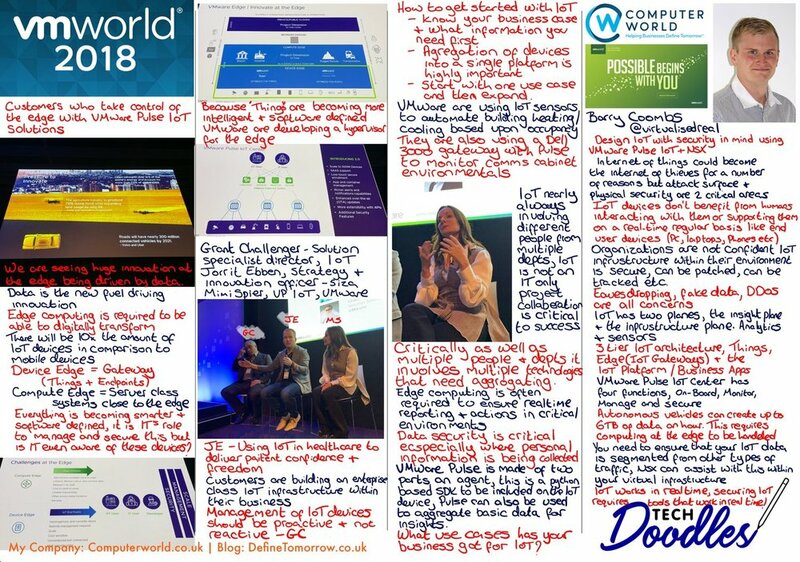 One of my main focuses from VMworld 2018 in Barcelona was IoT, specifically I was looking to better understand use cases that are going into production, architectures for the ‘things’, gateways, edge computing, data storage and analytics and how to manage, maintain and secure the IoT environment. You can see some of my thoughts from the sessions I attended in the Doodle below. IoT use cases are driven by a business or a personal need to analyse data for insight or to monitor something. There were fantastic examples given during VMworld specifically around how IoT was being used in healthcare to help give patients freedom whilst the healthcare workers are still able to ensure their safety and well being. The infrastructure for IoT is different depending on the specific use cases, the infrastructure starts with the ‘things’ or the senors. The specific requirement will dictate which sensors and the quantity however usually the sensors will interact with some form of a gateway due to the sensors either being propriety wired or using wireless using WiFi or more commonly a low energy form of wireless connectivity such as bluetooth low energy (BLE) or ZigBee. The gateway is able to aggregate the sensors from the differing forms of connectivity and forward on to the data storage and analytics location. If you manage to figure out your use case, collect the data with the correct sensors and infrastructure and you are able to get the answers you require with the correct analytics your work still isn’t done. We all know that security in end user computing and IT in general is a major concern, however if you look at the nature of IoT being disparate, involving many connected components and also not being directly monitored (Used) by humans the attack vector for IoT is massive. This is where VMware Pulse comes into play, VMware Pulse aims to be your management plane for your IoT infrastructure, on each of yours sensors or gateways an SDK Python based agent is deployed allowing the Pulse infrastructure to monitor and maintain your ‘things’. Pulse is able to ensure the ‘Things’ are communicating, working within normal parameters and are up to date, think of Workspace UEM (AirWatch) but for IoT. This is the very beginning of the IoT journey for myself, I would like to further understand the gateway and sensor technology as well as the management of the IoT infrastructure with Pulse. Watch this space as I learn more.